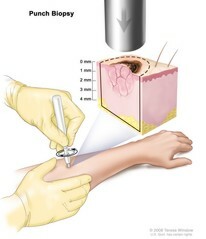 Punch biopsy; drawing shows a hollow, circular scalpel being inserted into a lesion on the skin of a patient's forearm. The instrument is turned clockwise and counterclockwise to cut into the skin and a small sample of tissue is removed to be checked under a microscope. The pullout shows that the instrument cuts down about 4 millimeters (mm) to the layer of fatty tissue below the dermis.